Hands up anyone who loves a good old-fashioned kohl liner?! I know I certainly do! Ever since I started wearing make-up I always loved to run a black kohl liner on my waterline (back when I thought I was super edgy!) and I love using one to create a soft feline flick or make my lashes appear thicker and darker my smudging a small amount into the lashline. 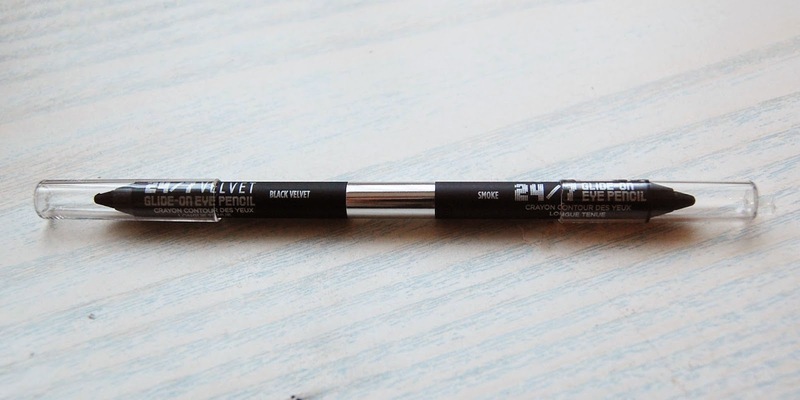 Being a massive fan of black liner and Urban Decay, you can imagine my excitement when I was able to take home their new Black Magic 24/7 Glide-On Double-Ended Eye Pencil Set* to try. From a company that is just as obsessed with black liner as I am, Urban Decay have released a set of four double-ended pencils for Christmas, with one of their signature black shades on one end a colourful shade on the other. It's no secret that their eyeliners are super pigmented, creamy and long-lasting, so I was just stupidly excited to get my hands on some new colours! The set also includes two shades, Black Market and Eggplant, which have recently returned after becoming temporarily discontinued, as well as Black Velvet, which contains their new 24/7 Velvet Glide-On formula. I apologise for the crappy quality of the photos - I took these when I was in the midst of moving out and I was rushing/stressed, so these are definitely not my best! Anyway as you can see, it has the gorgeous multi-coloured smokey packaging, which is absolutely beautiful. Each pencil's barrel is also perfectly matched with the shade of the liner, making it perfect for when you need to grab one on the go! 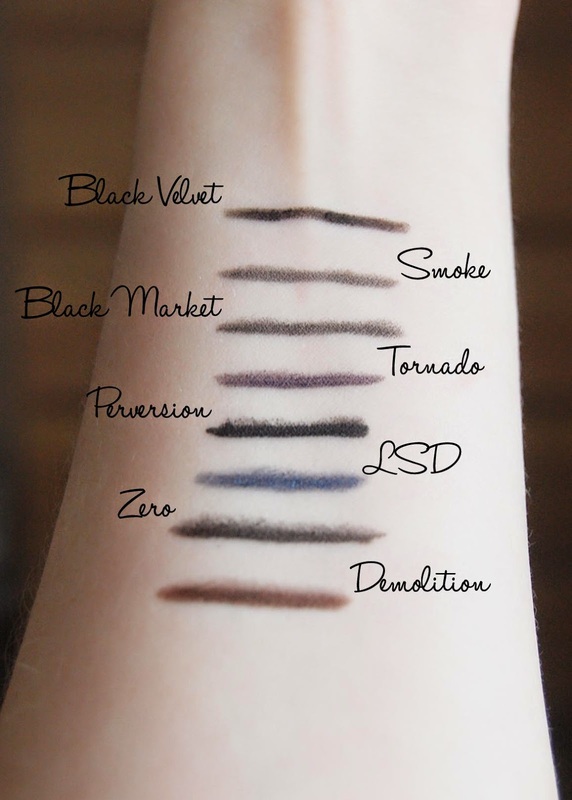 I can't believe that there are so many different versions of black liner! My favourite by far is Perversion - it's pigmented, creamy and industrial strength black. I love the subtlety of Demolition, but i'm excited to use Tornado as purple tones compliment blue eyes really well. 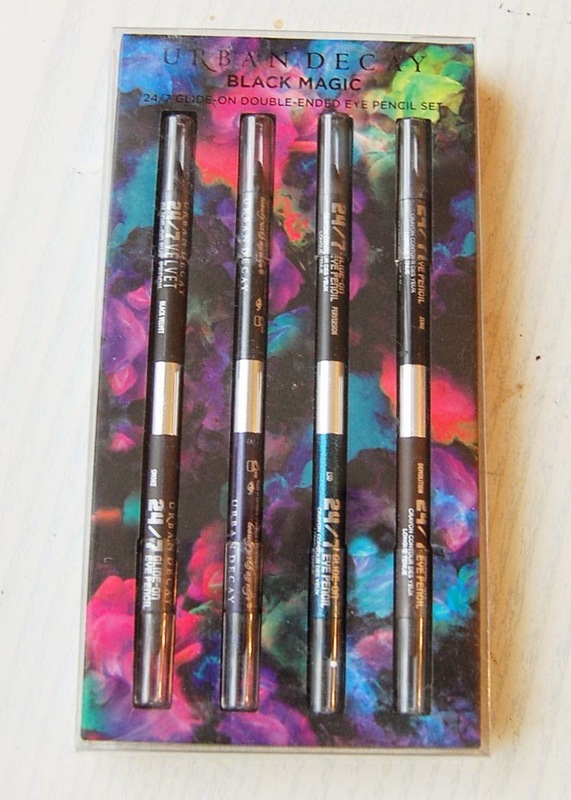 These would make a great Christmas gift for a Urban Decay junkie, or a good taster set for someone who wants to try out some of their products. What I will say though, is that once it dries it really dries. My usual make-up remover didn't take it off, so I had to resort to a specific eye make-up remover. Slightly annoying, but it is exactly what you want in a liner. Basically, this set is awesome. Coloured liner is a perfect way to put on a fun twist on your regular make-up routine, and I can't wait to get playing with these!